The rocketing star Mon Laferte continues to blaze her own fiery arc across the alt-Latino firmament. 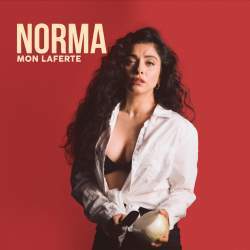 With Norma (her birthname), the Chilean-born belter takes a look back at classic Latin styles, polishing up a new facet to her musical personality with each song. Born Norma Monserrat Bustamante Laferte, the singer started taking to the stage before she hit double digits and got a boost from a Chilean reality TV show. She moved to Mexico to broaden her success, but her career came to a halt after she was diagnosed with thyroid cancer in 2009. After recovering, she changed her name and relaunched her career, eventually getting a “Best New Artist” Latin Grammy nomination in 2016 for her fourth solo album, Mon Laferte: Volume 1. Not quite as full retro as Gloria Estefan’s 1993 pre-Castro Mi Tierra album, Norma looks at different dance rhythms, from old-school mambo to psychedelic cumbia to a smoky bolero. But with each cut, she takes on a genre and adds her own personal twists, usually in the form of a bracing, rock ‘n’ roll roar. Fronting a Copa-sized band on “No Te Me Quitas de Aca,” Laferte transforms into a nightclub goddess. At one point as the big-band arrangement builds, she lets go a subtle growl as if her passion is too much for her to contain within the song’s polished façade. In the video for “Por Que Me Fui a Enomorar de Ti,” despite the powerful, razor-sharp blasts of brass and Laferte’s empassioned singing, the scene is slyly tongue-in-cheek: she’s dressed like a tattooed Carmen Miranda, the “band” are playful, cross-dressed dancers and amid the whirling dancefloor couples are a pair of men. While the album is mostly upbeat, Laferte’s backward glance also takes time for a slow dance in an acoustic bolero, “Funeral,” about a couple whose passion has died, in which she really gets to showcase her expressive voice as it goes from sweet and smooth to a throat-tearing cry. With some low and glowing electronics that sound a bit Roxy Music-ish on “Caderas Blancas,” Laferte lets her emotions rip as she locks eyes with a dark-skinned lover, telling him to take her “white hips.” She unleashes her rock ‘n’ roll voice, delivering the narrator’s unmistakable desire. The nostalgic-tinged title of “El Mambo” deconstructs a big band mambo arrangement, adding slices of rap. Throughout, Laferte’s voice billows and beseeches, sweetly whispers then wails; always standing firmly as the emotional heart of the song.